Our 232-hypothesis implies that the historical time line of Roman and Greek antiquity is not correctly synchronized with the astronomical or dendrochronological projections of the real time line. Therefore we would expect to find some irregularities in the written history of that time. In this section we have collected indications for such irregularities, we will add new indications when we find them. Chapters 4 to 7 in F.R. Stephenson's book "Historical eclipses and earth's rotation" (ref.1) are dedicated to Babylonian (and Assyrian) records of eclipes. Chapter 4 gives an excellent summary of which records still are extant, and how they have been handed down through time. Hipparchos had probably access to a large catalogue of Babylonian eclipse records, but only a few are preserved in Ptolemy's Almagest. Historically, the decline of Babylon started in RomBC 331 when the town fell to Alexander the Great. Later in the 3rd century RomBC it is said that the inhabitants of Babylon were moved to Seleucia and became more and more Greek. In the middle of the 2nd century RomBC, Babylon was in complete desolation and obscurity. Around RomAD 75, Pliny noted in his "Natural History" (ref.2), coherent with other historians, that "the temple of Jupiter Belus in Babylon is still standing—Belus was the discoverer of the science of astronomy; but in all other respects the place has gone back to a desert, having been drained of its population by the proximity of Seleucia". So, who made astronomical observations and wrote them down in cuneiform among Babylon's ruins at Pliny's time? We have a strong feeling that something is wrong with the synchronisation of Roman time towards an astronomical (absolute) timeline. The ancient city of Nineveh (near Mosul in Iraq) was sacked by Babylonians and Medes in Astr -612, an event which is absolutely dated on the astronomical timeline by Babylonian clay tablets. Some of the city's last defenders died in the gateway they tried to hold and were instantly buried by the collapsing roof of the gateway. Their remains were found in situ in 1990. Radiocarbon analysis of a couple of bone collagen samples from these remains gave an average calibrated date which was almost 200 years too old (though the raw values happened to appear in the right range) (ref.3). The paper by R.E. Taylor et al. includes a thorough discussion where a number of factors which could contribute to this large offset are ruled out because the sample preparation was carefully conducted. However, a heavy fish diet remains as a possible explanation for the anomaly. As we see it, an alternative to extensive feasting on imported boned, dried and salted codfish (Bacalhau), which could explain the lack of fish bones in the kitchen middens, would be an error in the radiocarbon calibration curve. 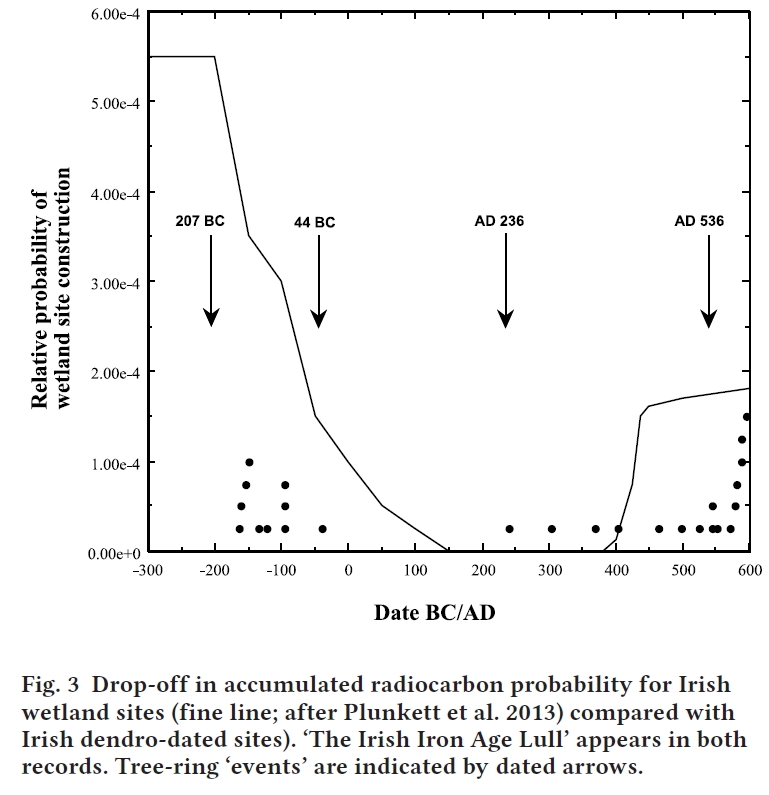 An error of this kind has been predicted after our analysis of the Belfast oak chronology (read here). This tree-ring chronology has been used to establish IntCal13, which is the radiocarbon calibration curve commonly in use. Cuthbert (c. 634 – 20 March 687) was a saint of the early Northumbrian church in the Celtic tradition. He was a monk and hermit, and was consecrated Bishop of Lindisfarne in 685. So what he saw could be interpreted as a fortified urban community in existence, with functioning aqueduct feeding the fountain and headed by a praepositus civitatis (a Roman official title meaning the community's authority). However, archaeological excavations have so far failed to support that image: the Roman city of Carlisle most likely vanished already during the fifth century AD (ref.5). There would be no problems if the Romans left the British Isles around 400 plus 232 years according to our hypothesis. Then Cuthbert would have visited Carlisle about 50 years later, before the decline of the town, in RomAD 453 when seen from the Roman time horizon. The man of the North had conquered and taken for his own this extreme corner of that "Romania" of which he had no memories, whose majesty he repudiated, and to which he owed nothing. In every sense of the word he replaced it, and in replacing it he destroyed it. Trier was founded by the Romans at the time of Emperor Augustus (Roman name Augusta Treverorum). In RomAD 275, the city was destroyed by the Alemannians. Between RomAD 293 and 392 the city, now called Treveris, was one of the residences of the western Roman Emperors. As such it also had an amphitheatre (ref.7), which stage machinery in the basement under the arena has been dendrochronologically dated to about RomAD 298 (from Roman time horizon) by Ernst Hollstein (ref.8). Except for the Roman site collection, covering 217 years from RomAD 70 to 286, Hollstein also measured and dated one worked beam, 227 years from Astr 442 to 668, which he interpreted as a later replacement or repair perhaps to facilitate the use of the site as a memorial place for Christian martyrs. With our hypothesis that the Roman dendro complex has to be dated 218 years later, the worked beam could be interpreted as a later, but still Roman replacement. Astr 668 would be the same as RomAD 436, which is still before the Franks seized Trier from Roman administration in RomAD 459. The overlap in the new position is too short, but its dendrochronology does not speak against our proposal, details see here. The authors call it "the most enigmatic period of Irish history", just during the most intensive time of Roman presence in western Europe! This hiatus would vanish if our proposed 218-years-shift of the Roman chronologies is true. If our association of the 188 apparition of Comet P/Swift-Tuttle observed in China with Caesar's comet is right, this would mean that the Chinese and Roman historical time lines are offset by 232 years, the Chinese time line being a correct projection of the real time line. So the question is: have there been any direct relations between Rome and China around that time, and were they recorded? If yes, is there any interesting information illuminating this case? There are indeed references to a large civilisation far to the west from China in the Chinese historical records beginning during the later Han period. This civilisation is called Da Qin and has been identified as being either Rome, the Roman Empire or the Roman eastern provinces. The seat of government is more than a hundred li (41.6 km) around. In this city are five palaces each ten li (4.2 km) from the other. Their kings are not permanent. They select and appoint the most worthy man. If there are unexpected calamities in the kingdom, such as frequent extraordinary winds or rains, he is unceremoniously rejected and replaced. The one who has been dismissed quietly accepts his demotion, and is not angry. They make gold and silver coins. Ten silver coins are worth one gold coin. In the ninth yanxi year [166 CE], during the reign of Emperor Huan, the king of Da Qin, Andun, sent envoys from beyond the frontiers through Rinan (Commandery on the central Vietnamese coast), to offer elephant tusks, rhinoceros horn, and turtle shell. This was the very first time there was [direct] communication [between the two countries]. The tribute brought was neither precious nor rare, raising suspicion that the accounts [of the ‘envoys’] might be exaggerated. These are quite fantastic statements. A circumference of about 40 km would mean a city area of about 130 km2, which is a tenth of the total urban area of modern Rome, or a third of the total urban area of modern Stockholm. So what the annalist most probably meant was that the city was very large. But what did he mean by "their kings are not permanent"? And he actually gives a name for the king of Da Qin at or slightly before 166: Andun, which could refer to the European name Anton. This appears to be nothing more than a fabulous story told of an ideal country far-away and is reminiscent of many such stories told by early European travellers to distant lands. He comments the statement "ten silver coins are worth one gold coin" with the remark that this probably refers to the Roman exchange rate of silver to gold which had been 10:1 at the time of Alexander the Great and hundred years later, and which was about 11:1 at Pliny's time (refs. 10b and 10c #12.2). Finally, the king of Da Qin in the year 166 has to be Emperor Marcus Aurelius (RomAD 161 to 180) who was a member of the Nerva-Antonine dynasty and had the by-name Antoninus. Now, what happens if Roman time is offset (i.e. conventionally dated too old) by 232 years? In that case the year 166 would be the same as RomBC 67 and we are historically not in the Roman Empire but in the Roman Republic, eight years before Julius Caesar becomes consul for the first time. There is no king but every year two new consuls are elected for the highest political office. Prominent Roman families compete for the political power, among them the Antonii whose most famous member is Mark Antony, but he will enter the political stage first about two decades later. Maybe it was a member of this family who sent envoys to the remote China with gifts which were regarded as "neither precious nor rare"? Actually, a Roman expedition to China seems more natural during the expansive colonisation phase of the late Roman Republic than during the reign of the Antonines. These Emperors probably had enough problems at the remote frontiers of the Empire. They tried to solve these problems by building expensive fortifications, thereby draining the public treasury. What about the "five palaces" in Rome? Republican Rome had no royal palace, but the Capitolium was regarded as the citadel and religious center of the city. Here the Tabularium was located, holding the Roman records of state. Besides the Capitolium, the city within the Servian walls was divided into four administrative regions (regiones quattuor, ref.11). The division into four regions remained in force until the reorganisation of Augustus in RomBC 7. Also the silver to gold exchange rate of 10:1 points at information about the Roman Republic rather than the Roman Empire. With that perspective the statements in the Hou Han Shu are not fabulous at all. On the contrary, they are the best historical support for our hypothesis so far. 1. Stephenson F.R. : Historical Eclipses and Earth's Rotation, Cambridge 1997. 7. Kuhnen H.-P., The Trier Amphitheatre, an Ancient Monument in the Light of New Research, in: T. Wilmott (Hrsg. ), Roman Amphitheatres and spectacula: a 21st-Century Perspective, Papers from an international conference held at Chester, 16th-18th February, 2007, BAR Int. Ser. 1946 (Oxford 2009) 95-104. 8. Hollstein, E. Mitteleuropäische Eichenchronologie. Verlag Philipp von Zabern, Mainz am Rhein 1980. 9. Baillie M. and Brown D. 2013. A Chronological Framework for the Period from 208 BC to AD 600. Emania, Vol. 21, p. 59 - 71. * Roman Republican Colonization. New perspectives from archaeology and ancient history (eds. Stek and Pelgrom), PAPERS OF THE ROYAL NETHERLANDS INSTITUTE IN ROME - VOLUME 62 - 2014. Preview, read here. * Richard Alston, Rome's Revolution: Death of the Republic & Birth of the Empire. Oxford University Press 2015. ISBN: 9780199739769. Preview, read here.